Update 3/9: KRMX made the move to Country “92.9 Shooter-FM” on Thursday afternoon. Chris Austin moves from 98.3 KORA Bryan/College Station to program and host middays. Terry Hunt will host mornings on Shooter. Original Report 2/29: M&M Broadcasters has launched Variety Hits “101.3 Bob-FM” on 1590 KLRK Mexia, TX and translator 101.3 K267AI Moody/Waco. 1590 KLRK had been Classic Country before going dark due to losing its lease for its transmitter site. It has a CP to operate with 2500 watts daytime and 65 watts at night, but has also has been granted an STA to operate with 625 watts daytime. 101.3 had been rebroadcasting “1660 ESPN” KRZI. 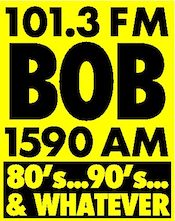 Bob fills the hole created when “106.7 Doc-FM” KDRP flipped to Country “Kix 106.7” a few weeks ago. Sister Hot AC “Mix 92.9” KRMX is directing its audience to 101.3 as its entire airstaff is shifting to the new station. 929Shooter.com and 929ShooterFM.com have been registered by Dustin Drew, the PD of KRMX.